Because I am a dermatology professional and I blog about skincare people often ask me for skincare regimen recommendations. And I don't mind that! I will often recommend a Rodan + Fields regimen because each one caters to most specific skin concerns that I hear on a daily basis. There is a regimen that targets dark spots and uneven skin tone, one that targets redness or hypersensitivity, one to treat acne or acne prone skin, and one that decreases the appearance of enlarged pores while diminishing/preventing fine lines and wrinkles. 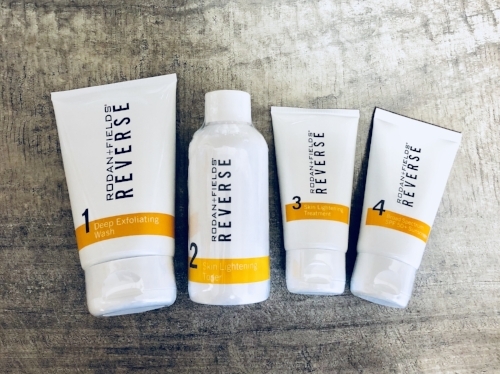 Many people appreciate the simplicity of a complete regimen with steps, and from personal experience and the experiences of my patients I have found that the products really do make a difference. However I can understand that they are pricey, and many people would like to know of cheaper alternatives. So I have done some research and I've compiled some potentially more affordable alternative regimens for each of them including Reverse 'lightening'/ Reverse 'brightening' for sun damaged skin or stubborn dark spots, the Redefine regimen for the improvement in appearance of pores/prevention of fine lines and wrinkles, the Soothe regimen for sensitive skin, and the Unblemish regimen for acne. I do believe that all of these listed regimens include high quality ingredients that have shown excellent results. But if you don't have that kind of money to invest into your skin then I feel ya, and your girl is still here for ya! The alternatives are also high quality products that I have thoroughly researched. I will be explaining the Rodan + Fields regimens and then listing the alternatives I found that are similar - i.e. products with similar ingredients that target the same specific concerns, but cheaper cost wise. This will be lengthy, so feel free to hit 'control F' to type in the regimen you have considered or your specific skin concern in order to jump ahead. Keep in mind, the best way to find what's best for your specific needs is to see a dermatology practitioner. 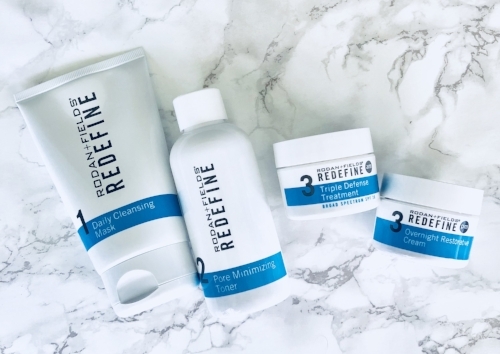 The Redefine regimen is formulated for the the improvement of appearance of fine lines, pores and loss of firmness. In other words it's the "anti-aging" regimen. If you don't have any specific concerns such as acne or pigmentation issues then this would be the regimen I would recommend to anyone and everyone. This is also the one that I currently use. I don't use it exclusively. Read more about this regimen and the other products I use here. This retails for $199 for a 2-month supply, or $179 for preferred customers. Step 1: Kaolin clay cleanser draws out impurities from pores without over-drying. Grainy but soft texture. Exfoliating. Step 2: Pore minimizing toner that contains lactobionic acid, an alpha hydroxy acid (AHA) that is rather new and apparently hard to find (trust me, I searched!). Because of its slightly different chemical structure lactobiotic acid is more hydrating than glycolic acid (Journal of Cosmetic Dermatology, 2010, source: FutureDerm). Studies have found it to be more tolerable than glycolic acid as far as skin irritation is concerned, and it's also been found to brighten the skin over time (FutureDerm). Step 3 AM: The triple defense treatment is a broad spectrum SPF 30 moisturizer with UVA/UVB protection + anti-aging peptides such as tetrapeptide-21 and antioxidants such as resveratrol. Step 3 PM: Overnight restorative cream that contains hyaluronic acid, glycerin, and vitamins A, C and E.
The Reverse 'lightening' regimen is for those who have stubborn dark spots, whether it's from sun damage, melasma or post-inflammatory hyperpigmentation from acne scars. It comes with an exfoliating cleanser, a skin lightening toner, a skin lightening treatment, and a broad spectrum SPF 50 sunscreen. It costs $190 for a 2 month supply at retail price, or $171 for preferred customers. Step 1: Deep exfoliating cleanser. Formulated with alpha hydroxy acids (lactic acid and glycolic acid) plus provides gentle mechanical exfoliation. Step 2: Skin lightening toner. Hydroquinone 2% lightens dark spots to even out overall skin discoloration. Also formulated with kojic acid and vitamin C, both of which also help reduce stubborn dark spots. Step 3: Skin lightening treatment. This also includes 2% hydroquinone as the active ingredient. Other ingredients that work to lighten dark spots include vitamin C, retinol, and lactic acid. Step 4: Broad spectrum SPF 50+ sunscreen. A combination of stabilized Avobenzone and colorless carotenoids provide prolonged sun protection. Vitamin E and green tea brighten the skin and protect it from damaging free radicals. When I recommend a regimen for dark spots I often recommend starting with the Reverse 'Lightening' as described above. However hydroquinone, the bleaching agent, is not meant to be used long term as that can cause adverse side effects. After 2-4 months it's time to switch to the Reverse 'Brightening' regimen which helps prevent the dark spots from recurring. This one contains retinol and vitamin C, both of which can be used long term to maintain even, bright, and healthy skin. 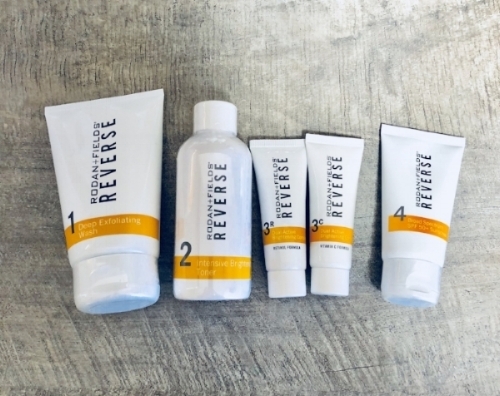 The Reverse 'brightening' regimen costs $190 for a 2 month supply at retail price, or $171 for preferred customers. Step 1 (same as Reverse 'Lightening' above): Deep exfoliating cleanser. Formulated with alpha hydroxy acids (lactic acid and glycolic acid) plus provides gentle mechanical exfoliation. Step 2: Intensive Brightening Toner. Includes kojic acid, salicylic acid, vitamins, and licorice to brighten skin and even out skin tone. This formulation does not contain hydroquinone. Step 3: Dual Active Brightening Complex. Notice there are two step 3 bottles here. One is retinol and one is vitamin C; the two are mixed together and applied onto skin following the toner. Step 4 (same as Reverse 'Lightening' above): Broad spectrum SPF 50+ sunscreen. A combination of stabilized Avobenzone and colorless carotenoids provide prolonged sun protection. Vitamin E and green tea brighten the skin and protect it from damaging free radicals. The 'Unblemish' regimen for is for individuals with existing acne or acne-prone skin. Very good for mild to moderate acne. For severe acne that includes cystic lesions it's always best to go straight to the dermatologist. I have had patients do excellent with this regimen in conjunction with short term oral antibiotics in order to clear up existing lesions. After a few weeks or months of antibiotics they have done well with the regimen alone for prevention of new acne lesions. For severe acne I highly recommend seeking professional medical treatment. I gave this set to my sister for Christmas last year and she used it along with Differin gel. She noticed a significant improvement in her acne, but she couldn't afford to continue on the regimen (this one cost $180 for a 2 month supply, or $162 for preferred customers). Plus, she told me that in her opinion, the sulfur wash was the product that was really helping her acne. So now she only uses the sulfur wash, an over-the-counter Neutrogena benzoyl peroxide cream, and Differin. Her skin looks great! And I think I agree that the sulfur wash is the rock star product here. It's not easy to find one like it. Plus I always found sulfur to be the only thing that even had a chance against my cystic pimples. As far as the sunscreen - I don't think SPF 20 is good enough especially when you're trying to prevent acne scarring. Step 1: Acne treatment sulfur wash. 3% sulfur works to unclog pores and reduce inflammation associated with acne. Also formulated with botanical extracts which have antibacterial properties and work to soothe and heal inflamed skin. Step 2: Clarifying Toner. Alpha hydroxy acids for gentle exfoliation to remove any remaining residue on the skin/unclog pores. Green tea and aloe vera to soothe. Step 3: Dual Intensive Acne Treatment. 5% benzoyl peroxide (antibacterial + anti-inflammatory). Also contains B vitamins and ceramides to help retain moisture in the skin. Acne is tough. There is no one regimen that suits all. It has to be SO customized. See your dermatologist. But okay now that I've ranted all about that, here is something else that I put together for acne-prone skin. 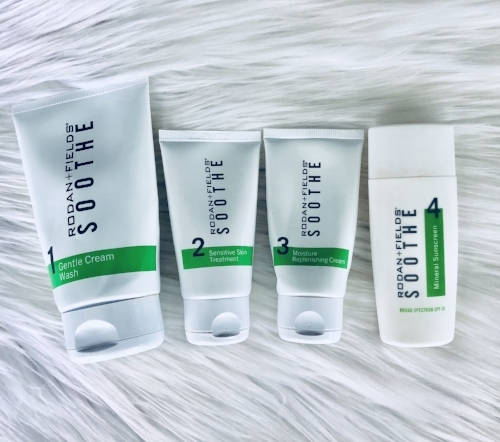 The Soothe regimen is tailored for those who have sensitive skin including eczema, seborrhea, rosacea or just general hypersensitivity and redness/irritation. I personally used this one during the winter months when my face would often get red and scaly around my the creases of my nose. The retail price is $170 and $153 for preferred customers. Step 1: Gentle cream wash. This does not contain any surfactants (which can be harsh on the skin and strips it of its protective oils). At first it seems odd because it does not foam or create any suds. But it thoroughly cleanses the skin and the moisturizing ceramides leaves it feeling very hydrated. Step 2: Sensitive skin treatment. This product contains R+F's RFp3 Peptide Technology which is a a combination of peptides that calms and soothes the skin. Step 3: Moisture replenishing cream. Rodan + Fields uses a patent-pending formulation process that results in a creamy moisturizer that does not have traditional emulsifying agents (which can irritate skin). Includes lots of fruit seed oil sand botanical extracts. Step 4: Mineral sunscreen. Mineral sunscreen that is both moisturizing and calming. So there you have it! I've been wanting to compile these alternatives into a blog post for a long time and I put a lot of time an effort into it. I am a Rodan + Fields consultant so I definitely want to disclose that. The other products do have affiliate links so I will get a small commission for any products purchased (very much less than I get from Rodan + Fields). If you have found something similar to a R+F regimen that you love please share in the comments! I hope this was helpful! Curious about my personal skincare regimen? Click here to learn about what I use daily!